Holi the festival of colours is one of the best festivals and occasions that spell complete fun, mirth and joy! And other than spreading the cheer and soaking in all the enjoyment through the colours, this is also a wonderful time to maximize on the best deals available for online shopping. This is the time where you can bag some of the best deals that are available on the latest mobiles and its accessories. These offers, will allow you to make the most of the latest mobile brands and buy the Smartphone of your choice within a great price deal along with other accessories like Bluetooth device, plug in devices, selfie stands and the like. To select the best deals that are available for Holi on mobile devices you can make the most of the promo codes that are listed on HappySale and activate your deal. Zivame Holi sale is live now! No discount coupons required. Hurry up and avail now! Lifestyle Store Holi sale is here! Nykaa Holi Hungama is here! Max Fashion Holi sale is here! Ajio Holi Sale is here! No coupon code required to avail this offer. Get today! Shop at Hi2Buy and avail upto 85% off on various products across the site. Choose from massive collection of women kurtis, sunglasses, sandals, sarees, ethnic suits, tops, earrings, track pants, T-shirts, formal shoes, sports shoes, casual shoes and more. No promo codes required to get this offer. Shop and avail now! The festival of colours is almost round the corner! It’s a day when you can simply go all out and have all the fun with colours. And whilst most of the world is planning up to spend the festival of Holi by playing colours with friends and family, there’s more that you can do. If you are someone who loves to shop online, then this festival brings for you ways to save on the best buys that are available online. All you need to do is simply browse into HappySale and you will have the chance to have access to some of the best HappySale Holi offers and shop for the best products and save big! So get browsing now. If you have a post Holi party to attend at home or evening, you perhaps would want to look your best and dazzle. This is where you can count on the HappySale Holi offer codes to help you select the best attire for you from popular brand and within your budget. There are multiple shopping websites that are already buzzing with some of the best offers and discounts. Few of the popular brands that you can search online at HappySale include names like PeachMode and LimeRoad. Here you will find the best deals on women’s ethnic clothes and everything comes within a price that’s pocket-friendly. There’s no reason to think that you cannot opt in for the HappySale Holi offer codes because you have never done it till now. There’s always a first time. And in HappySale other than being able to grab the best discount offers you also have the chance to opt in for the first time user deals. So all you have to do is simply browse through HappySale Holi deals and select the one that you would want to go for. After than click on the “show code” option and you will get a code that you can get use when you are making the payment and redeem your discount percentage. So search for your best deals today. Everybody loves to get gifts! It’s something that lightens then up from within. Making another person who you care for and love and are a friend to, feel special during Holi is a sweet and loving gesture. And if you have a list of people who you want to gift, then using up the HappySale Holi offers is a good way to shop for less. You have the chance to get everything from pichkaris, chocolates and even gujiya. So go ahead and browse the best gifts online. You can also plan to send gifts to your relatives and friends who stay in a different time zone. One of the popular brands to shop for your female friends is Nykaa. You can shop from this brand online and have access to a discount of 40% on all the beauty products and make-up goods. There are some of the best brands to opt in for as well, such as Kaya, Loreal, Nivea, Rimmel, Vaselin, Olay, Ponds, Aviance and many more. So keep browsing and checking the best deals on offer. Do you have a vacation in mind? 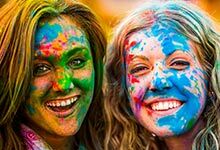 If you have been thinking on taking a vacation during the time of Holi, then you can browse through the HappySale Holi offers to get some of the best discounts on your tickets. There are some of the best deals and discount codes from Cleartrip that has been listed online. Using the offers you have a chance to get a cashback of Rs.2500 instantl on all your domestic flight bookings and hotel bookings. That is not all. If you make your payments using Paytm then you can get a discount of Rs.111 on your bus tickets. Brands like Mobikwik is providing a flat cashback offer of 25% on all bus ticket bookings as well. For some of the best holiday destinations outside of India, you will have the chance to get a discount of Rs.12000 and more. So don’t waste time! Simple have a destination in mind and the b browse into HappySale Holi offers and deals and select the best holiday and vacation offer listed online. There are more discounts on offer! Other than holiday destinations you also can have some of the great deals and offers on your everyday travel and conveyance. When you book an Ola outstation cab and use the HappySale Holi offers you have the chance to get a cashback of Rs.250 on your overall bill. So if you have been cancelling your plan for a one day or two day outstation journey, then don’t. Using this offer you can save and travel easy. If you though that Holi offers in HappySale are all about adults, then there’s news for you. As you browse you will come across brands that provide child care products such as FirstCry that has come up with some of the best products and offers as well. At FirstCry you will have the chance to have access to the Holi Fashion Sale for the toddlers where you will get garments and accessories for the little ones at a great discount of 40%. So go ahead and pick up those attractive baby girl dresses and trendy baby boy toys and get it all within a good discount. If you are a regular online shopper and have been searching for the best and verified Holi offers of the day, then HappySale is the best place to browse and get your latest deals. This website scans the internet and lists down only those offers that are pocket-friendly and have a value to offer. So you can browse on and check out the deals and discounts, read more on the same to know the deals well and then opt in for the one you like and activate it prior to the deal expiry date.